And although it's the duty of any ghost writer worth his laptop to be discreet and forsake all credit in making the individual he's writing memoirs seem even more extraordinary on paper, in the case of the ghost in filmmaker Roman Polanski's sophisticated new film, McGregor is not merely the second fiddle but rather the second fiddle of a second fiddle in his assignment writing the life of former prime minister Adam Lang (Pierce Brosnan). The fifth and last interviewee who openly tells Lang's agent (Timothy Hutton) that he-- like everyone else-- doesn't read political memoirs, McGregor's ability to turn things around quickly as evidenced on his curriculum vitae lands him two hundred and fifty thousand dollars for a month's work as a replacement ghost after the first scribe wound up mysteriously dead on the shoreline. Mugged on the way home by hoodlums who only swipe another manuscript handed to him for a read-through by Lang's agent, McGregor is in for several more shocks when he realizes just how dangerous politics can be. And soon he learns he's only allowed to read the dull autobiography in the privacy of the Lang estate as it's kept under lock key and security code by the woman openly having an affair with the married politician, played by an understated Kim Cattrall. Yet the simple tweak job turns into a massive overhaul when Brosnan's Tony Blair-like character (and the subject of the book) is threatened by the Hague of being convicted of war crimes in knowingly sending suspects away on “torture flights” following the 9/11 attacks. Hastily, McGregor becomes embroiled in the mess after he lends his professional assistance in writing a statement of denial that makes him an accomplice, should the accusations prove true. Although McGregor is able to just turn off his moral judgment like a light-switch to work on the book, it becomes increasingly difficult to ignore the evidence and further inconsistencies in Lang's statements and the facts. And his suspicions are both confirmed and aroused after he uncovers documents and a GPS vehicle route left by the original deceased ghost. Additionally, he's lured into a web of seduction, which blossoms in the midst of scandal-induced isolation when he falls into bed with Lang’s wife (Olivia Williams). 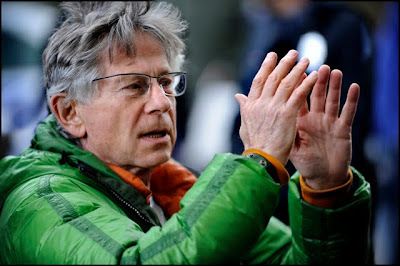 Frequently dubbed in the advertising as Polanski's first thriller in over two decades, the film which has just earned the exiled Oscar winning filmmaker the director prize at Berlin is likewise one of the strongest English language mysteries for adults to hit the multiplex in a long time. Moreover, it proves once again just how in-tune Polanski is with this particular genre, culling techniques and employing-- whether consciously or not-- the same type of imagery, comeuppances, love triangles, mistrust of authority, and startling conclusions that have been the hallmarks of his career from Knife on Water through Chinatown and Frantic. Again water serves as major visual piece to the psychological puzzle, which has been woven throughout his oeuvre since the beginning. And when you blend the image and connotations of water along with themes of deception, sins of the past, and questions surrounding just who we’re letting into our little worlds, Ghost Writer begins echoing Frantic, Chinatown, Death and the Maiden and others from Polanski’s unique twist on the genre. To this end, it’s certainly tempting to study the overlaps in his work, whether it's in his acknowledged fondness for Hitchcock and Chandler (which led to the film) or the definite autobiographical elements including a sense of Shangri-la in reverse, the transient nature of luck, persecution, accusation, and death that are blended together to masterful effect in Ghost. While admittedly it does struggle a bit in the pacing of the work, which you can attribute to the fact that it’s hard to get a handle on the characters, luckily our hero is engaging because of what McGregor naturally brings to the role personality-wise as opposed playing the ghost in the aloof manner one would assume from the profession and original title of The Ghost. Furthermore the film more than makes up for its shortcomings of a padded second act via some wicked surprises, which is most evident in another one of Polanski’s instantly classic endings that you could line up side-by-side with at least three of his others in terms of similarity and cinematic effectiveness. 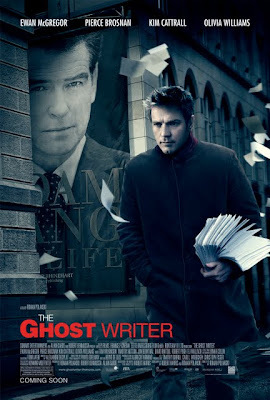 One of the best twist-filled mysteries for grown ups since Transsiberian and the foreign film Tell No One, The Ghost Writer is also quite timely as an overt George W. Bush/Tony Blair allegory, based on author Robert Harris’ 2008 “Thriller of the Year” best-selling novel, keeping political minds stimulated almost as much as film buffs’ as the type of purely Polanski film that begs to be seen twice.